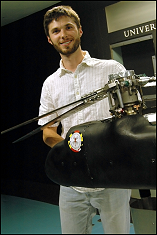 Congratulations are in order for Benjamin Berry, the 2012-2013 recipient of the Sikorsky Aircraft Fellowship. The fellowship awards the recipient $10,000 toward educational expenses. Students are nominated by their institution and Sikorsky selects finalists. The winner is then chosen by the Clark School Graduate Advisory Council. Berry completed his B.S. in aerospace engineering at the University of Maryland in 2004 and his M.S. in aerospace engineering at Georgia Tech in 2006. From 2006-2008, Berry worked at Groen Brothers Aviation in Salt Lake City, UT on the DARPA Heliplane program. He returned to UMD in 2008 to pursue his Ph.D. and is currently conducting research related to slow-rotor, high-advance ratio aeromechanics. Berry is a member of the record-setting Team Gamera, AIAA, AHS, SAMPE and Engineers without Borders.